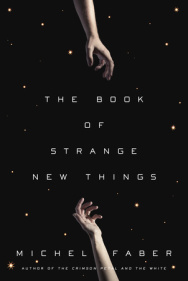 On redemption and Christianity in The Book of Strange New Things. So, I read a couple reviews that didn’t like Michel Faber’s The Book of Strange New Things. The problem was, in the reviewers’ eyes, that the novel as science fiction was bland (e.g. this piece from NPR). And I’ll admit, I wasn’t having fun for most of the time I spent reading it. But at the end of the book, Faber pulled a trick that really altered the way I viewed his work, and I haven’t seen any other reviews that engage with this idea. I do wish that more of the book was spent on this concept, and that there was less of the tepid sci-fi odyssey and orthological tomfoolery and emailed monologues, but so it goes. There really is a beautiful idea nestled in his story. To me, the most interesting facet of The Book of Strange New Things was the way it explored the question, is the possibility of redemption necessary for Christianity to work? And Faber explores the idea of redemption on many levels: physiological, personal, societal, ecological. It’s that breadth of engagement with the concept of redemption that made the work for me. Like, yes, the protagonist is an ex-junkie preacher. He was bad, turned his life around, found Jesus, is Christian. Which is fine, but I have Dostoyevsky for that; if Faber offered only that same narrative dressed up in tinfoil on a far-off planet where the water makes you piss green, well, I’d pass. Why not re-read Crime and Punishment instead? But I really like that Faber took the idea of redemption further. There’s a scene in the book where his protagonist is bitten by a wild animal, at which point the natives of that planet give him up for dead. He assumes the animal is poisonous, that there’ll be no healing from the wound. But then he gets better. And it turns out that the alien species lacks wound healing of any kind. If they become injured, they die. And that may underlie their fascination with Christianity: in the Bible, physiological redemption isn’t just a metaphor for personal redemption. Physical healing is made possible through the love of God. The most important miracles are instances of Jesus as medical doctor. This point is really underscored by the protagonist’s earlier efforts to translate the Bible into something the aliens would better understand. He spent a long time thinking about the idea of sheep and shepherds, which aren’t present on their world, and of oceans and fish and fishers of men, likewise absent, but never realized that any reference to Jesus’s doctoring would seem magical to them. When their bodies are hurt, there is no redemption. And Faber explored ecological and societal situations that would seem to have no possibility for redemption. The earth of Faber’s novel has passed an ecological tipping point and is spiraling from one natural disaster to another; messages from the earthbound wife make clear that the planet won’t be habitable for long, and (in another shopworn sci-fi touch, the sort of thing that would make me dislike the book if I were engaging with it as science fiction and not as religious meditation) the reason a human colony was established on the alien world is to serve as refuge for a small population of humans that will be saved. Society also seems to have descended into irreparable chaos. The world has become violent and cruel, so much so that the protagonist’s wife finally writes to let him know that she is doomed; he should never return to Earth. She’ll try to join a band of survivalists and scrape out a meager existence during what little time remains. He decides to return. To attempt to find her. He’ll try for redemption where no redemption seems possible. And the book ends. Honestly, it’s not a simple message. Because there’s a contrast; Christianity is hinted to be a poor fit for people who can’t heal, and yet the protagonist returns to a doomed world. Which you could perhaps interpret as Faber trying to convey that small-scale personal and physical redemption are more important than anything that happens in society, but I don’t think that’s it. The message I took away was that Christianity would not work in situations where healing was not a possibility, whether that healing means turning your life around, getting better after an injury, the climate restabilizing under habitable conditions, but that, akin to Kierkegaard’s leap of faith, a Christian should be unable to accept the idea that healing isn’t possible. Many types of injuries that aren’t problematic now used to be fatal. Bacterial infection would set in, spread through a body, and kill a person. That’s why amputation was so common; for much of human history, there was no other way to stop infections. Then antibiotics were discovered. Antibiotics are like magic. They are Jesus’s miracles in pill form. You get sick, you should die, you swallow one pill a day for a few weeks, you are healed. You live. Praise the saviors. But antibiotics are getting worse. Or, more specifically, we are putting selective pressure on bacteria to evade or degrade those magical molecules. The idea of feeding subtherapeutic doses of antibiotics to huge numbers of densely-housed animals, year in and year out, seems insane to me. Honestly, that’s a set-up not so dissimilar from what you might employ in a purposeful gain-of-function directed evolution experiment. That is, if you wanted to create antibiotic-resistant bacteria, that’s something you might do. And if antibiotic resistance arises in one line of bacteria, it’s unlikely to remain isolated to that population for long. Horizontal gene transfer, including from one species to another, is very common amongst bacteria. The point being that we are bringing ourselves — intentionally, it would seem like — closer and closer to a post-antibiotic era. The magic in those pills might soon be gone. And we’ll be much worse-off than we were pre-antibiotics; the world is different now, including much higher population densities in urban areas. Quite likely, bacterial infections will spread more voraciously than they did in the pre-antibiotic era. To me, that increases the resonance of Faber’s work. Those aliens, groping ineffectually through Christianity because, once harmed, they can not heal? They could be our future selves. On inspirational women … and board games. On video games, addiction and Infinite Jest: The Movie.